I presented a short paper derived from my thesis work at the 131st Convention of the Audio Engineering Society in New York City. 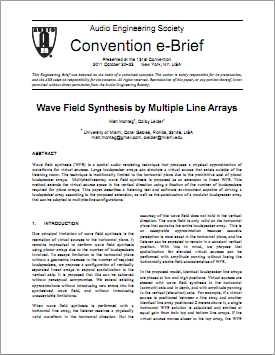 The paper is titled Wave Field Synthesis in Three Dimensions by Multiple Line Arrays. The paper focuses on subjective assessment of a modification to traditional wave field synthesis. I met Dr. Frank Melchior, CTO of IOSONO, after the presentation. Dr. Melchior also presented an assessment of modified WFS at the convention. Wave field synthesis (WFS) is a spatial audio rendering technique that produces a physical approximation of wavefronts for virtual sources. Large loudspeaker arrays can simulate a virtual source that exists outside of the listening room. The technique is traditionally limited to the horizontal plane due to the prohibitive cost of planar loudspeaker arrays. Multiple-line-array wave field synthesis is proposed as an extension to linear WFS. This method extends the virtual source space in the vertical direction using a fraction of the number of loudspeakers required for plane arrays. This paper describes a listening test and software environment capable of driving a loudspeaker array according to the proposed extension, as well as the construction of a modular loudspeaker array that can be adapted to multiple-line configurations.